Before the rise and spread of Christianity in the first millennium of the common era, paganism was the common religion of Europeans. Just as there is not a single Christian faith, but many denominations and sects, there was no single set of beliefs that one could identify as “pagan.” For example, the Greeks, Germans, and the Celts had different myths explaining their origins, and beliefs and practices were far from uniform across these peoples of Europe. Among the most colorful of these myths is Norse mythology, first written down in the Eddas during the Medieval period of Iceland. In one of my previous articles, I hypothesized that the West Indies archipelago is the remnant of a continuous land bridge that together with the Central American isthmus, completely encircled the Caribbean Basin, thereby isolating it from the World Ocean . As a result of this isolation the Caribbean Sea evaporated away, leaving behind a dry and habitable basin. I also argued that the Taino Indians myth recounting how the sea was created was referring specifically to the creation of the Caribbean Sea , as opposed to the creation of the entire ocean or any other body of water. In this article, I shall argue that the Norsemen also preserve the account of a strange and wonderful land doomed to destruction, a land that upon closer inspection bears a striking resemblance to precisely this dry and habitable Caribbean Basin, were it had to have existed. This cyclical destruction and creation of the world as described by the Eddas resembles the cycles of desiccation and flooding that scientists believe occurred in the Mediterranean Basin, which underwent several of these cycles several millions of years ago, the last one occurring circa 5.3 million years ago. The dry Mediterranean Basin, when it was reflooded by the Atlantic Ocean, is fittingly described as “sinking back into the sea and vanishing below the waves.” Likewise, when the sea became landlocked once more, it would have evaporated away, and an onlooker who was not well-versed in scientific terminology might have very well described the earth as having been “raised from the ocean”, rather than the landlocked sea having evaporated away, thus transforming what was previously seabed into dry land. But since the last cycle of drying and reflooding that the Mediterranean underwent was supposedly 5.3 million years ago, no account thereof should have been preserved to mankind, unless ancient man’s knowledge of science was somehow advanced enough to conceive of this cyclical process without having witnessed it first-hand, an unlikely scenario at best. Therefore, if the cycle of creation and destruction that is so central to the Norse worldview really is referring to the cycle of drying and reflooding of a marginal basin, as I have suggested, this basin must be a different one than the Mediterranean. However, even if it is granted that there is a connection between the cyclical nature of Ragnarök and the cyclical nature of the desiccation and reflooding of a marginal basin, it has not yet been demonstrated that the marginal basin being referred to as Ragnarök is specifically the Caribbean Basin, which is what I wish to demonstrate. There could very well be other marginal basins and seas that have underwent this same cycle of desiccation and reflooding that scientists have not yet acknowledged. For example, the Arctic Ocean, though it is usually classified as an ocean in its own right, has been thought of as a marginal sea of the Atlantic Ocean by some oceanographers. Establishing that Ragnarök refers to the cyclical flooding and desiccation of not just any marginal basin, but specifically the Caribbean Basin, demands extraordinary evidence, as it is very much an extraordinary claim. First, to suggest that Ragnarök, a myth of Norse provenance, refers to events taking place in the Caribbean region seems almost absurd, as the Caribbean Sea and Northern Europe, the homeland of the Norse peoples, are separated by a vast ocean. Secondly, it has only been demonstrated thus far that the Caribbean Basin underwent a single cycle of flooding and desiccation (in my other articles). However, it is necessary to establish that the Caribbean Basin underwent multiple cycles of flooding and desiccation to equate these cycles with Ragnarök, as Ragnarök specifically refers to a cycle that repeats indefinitely over time as opposed to a single occurrence. Surprisingly, there are numerous resemblances between Norse mythology and the geography of the Caribbean Basin. 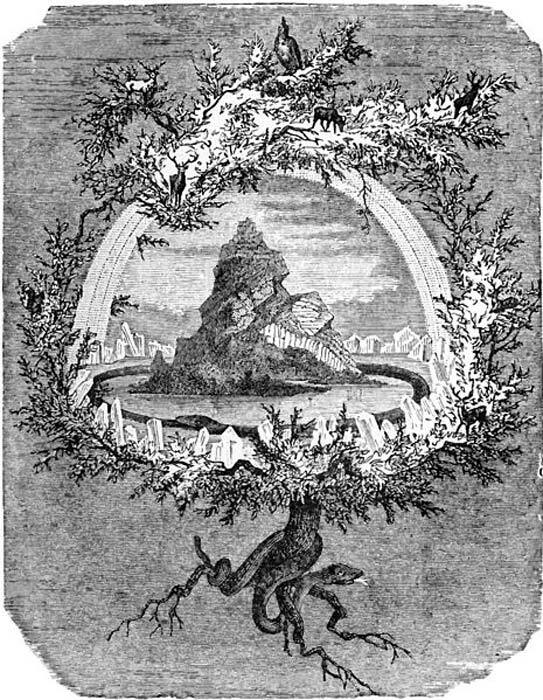 Central to the Norse cosmology is Yggdrasil, the World Tree, whose branches and roots form the Nine Worlds. Midgard and Asgard are two of these nine worlds. 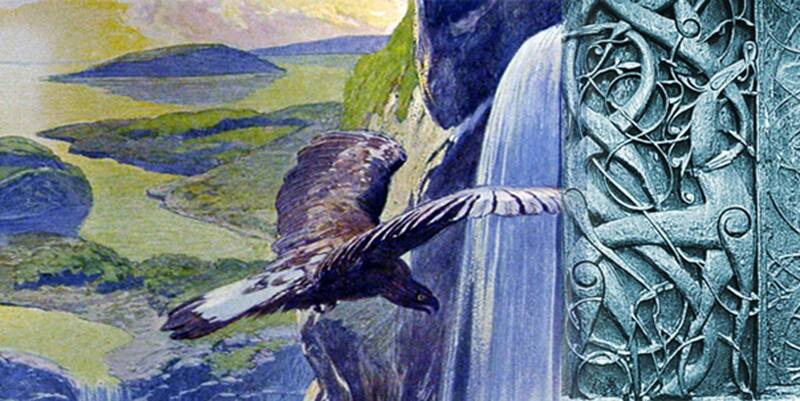 Midgard was said to be surrounded by a vast and impassable sea in which dwelt the serpent Jörmungandr. This serpent was described as being “so enormous that his body forms a circle around the entirety of Midgard.” Interpreting this serpent as a geographical feature instead of as purely a metaphorical device, it bears a strong resemblance to the land bridge (whose remnants are the Central American isthmus and the West Indies island arc) that I supposed encircled the Caribbean Basin. Just as the Caribbean Basin, were it to have been dry, must have been completely surrounded by this hypothetical land bridge, Midgard is described by the Eddas as having been completely surrounded by Jörmungandr. The parallels between Midgard and Ragnarök, on one hand, and the Caribbean Basin and its cataclysmic flooding do not end here. In the Gylfaginning, the first part of the Prose Edda, the serpent Jörmungandr is described as not only surrounding Midgard, but also as “grasping its own tail in its fangs”; furthermore, it is stated that when the serpent releases its tail, Ragnarök will begin. If this serpent that completely encircles Midgard prior to Ragnarök is indeed a metaphor for a continuous land bridge surrounding the Caribbean Basin prior to its flooding as I have supposed, then the cause and effect relationship in which the serpent releasing its tail causes Ragnarök to occur can be literally interpreted as a gap forming in this continuous land bridge causing the apocalyptic flood in which the Caribbean Sea is formed. If the precise nature of the destruction unleashed by Ragnarök were not specified, then this connection would be rather flimsy, but the Eddas unambiguously specify that Ragnarök causes Midgard to sink into the sea and vanish below the waves. In other words, the agency of destruction in both the Ragnarök and the destruction that would befall the Caribbean Basin were the land bridge surrounding it to collapse, is water. Just as the forming of a gap in the “serpent” that encircles Midgard signals the onset of a doomsday scenario in which Midgard sinks into the sea and vanishes, the forming of a gap in the hypothetical land bridge (the collapse of any part of this land bridge to below sea level) surrounding the Caribbean Basin would have caused the waters of either the Pacific or the Atlantic Oceans, depending on where the collapse occurred, to begin to pour into this basin in a deluge of epic proportions, causing the basin to ultimately vanish into the sea. Finally, it would be poetically apt to describe this continuous land bridge encircling the Caribbean Basin as a “giant serpent,” for the Central American isthmus and a continuous West Indies landmass are indeed serpentine, their lengths being much greater than their widths. Now I shall demonstrate that the Caribbean Basin must necessarily have undergone in the past and will go through in the future not merely one, but multiple cycles of desiccation and flooding. First, I will prove, using a probabilistic argument, why it is not only plausible, but essentially inevitable given the passage of a sufficient interval of time, that the West Indies island arc will become a continuous and unbroken chain of land lying entirely above sea level, thus causing the Caribbean Sea to become isolated from the Atlantic Ocean and evaporate away. As can be seen in the map below, the West Indies island arc is dotted by numerous volcanoes along its entire length. Many of these volcanoes are active or dormant, meaning that they have not erupted recently but are expected to do so in the future. But this map, which only shows volcanoes that are situated on islands that are already above sea level, does not fully represent the entirety of the volcanic activity that occurs along the island chain, and specifically omits the submarine volcanoes located between the individual islands making up the island arc. 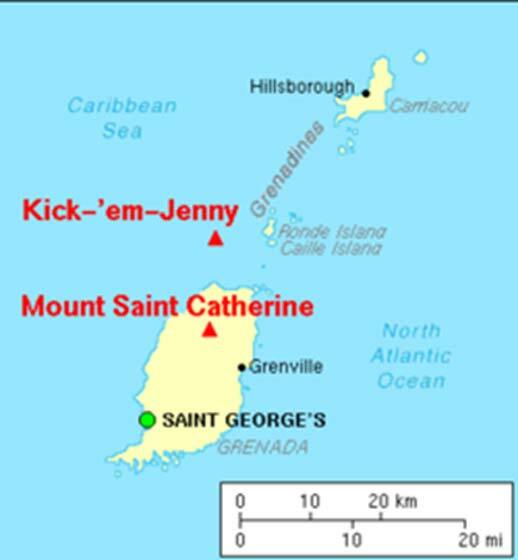 One such volcano, discovered in 1939, is named “Kick ‘em Jenny,” and is located between the islands of Grenada and Carriacou. Its cone rises almost 5,000 feet (1524 meters) above the seabed and lies less than 600 feet (183 meters) underwater. According to Dr. George Pararas-Caryannis, a distinguished marine scientist, Kick ‘em Jenny is rising at an average rate of 12 feet (3.6 meters) per year, and is expected to reach the surface and become an island sometime this century. In addition, there is a submarine volcano located in the channel between Les Saintes and Basse-Terre (the name for the western half of the island Guadaloupe). These submarine volcanoes provide strong evidence that volcanoes are not found only on islands that are presently above sea level, but also between them. Furthermore, as can be seen from the map below, volcanoes are present throughout the entire Central American isthmus. In other words, volcanic activity is prevalent along the entire boundary of the Caribbean Plate, both in the portions that are currently above the sea (Central America and the islands of the West Indies) and in the parts that are presently below the sea (the channels between the islands of the West Indies) rather than being confined to the islands that are already above sea level. In the example of Kick ‘em Jenny, Dr. Pararas-Caryannis concluded that th volcano would rise above the sea and become an island sometime later in this century (based on its present rate of rise). Of course, this conclusion presumes that future eruptions will, on average, result in an increase rather than a decrease in the volcano’s height. The latter case, an eruption that reduces the height of a volcanic cone, is by no means a hypothetical scenario. For example, Mt. Pelee’s height (a volcano located on the island Martinique) was reduced from approximately 5,100 feet (1554 meters) to 4,587 feet (1398 meters) when it violently erupted in 1902, as was Mount St. Helens when it blew its top off in 1980. Of course, other eruptions of Mt. Pelee must have caused its height to increase, as if there were no such eruptions and all eruptions caused a decrease in height, Mt. Pelee would not even be a mountain at all, but a giant depression, which is clearly not the case. This observation is not limited to Mt. Pelee, but can be generalized to all volcanoes, and especially stratovolcanoes, which are the predominant class of volcanoes found along the rim of the Caribbean Plate: that is, different eruptions of the same volcano can result in either an increase or a decrease in that volcano’s height. Top Image: The new world that rises after Ragnarök, as described in Völuspá ( Public Domain ), and depictions of snakes and dragons that represent Ragnarök ( CC BY-SA 2.5 ), Deriv. The rectangular plain that Plato describes in his dialogues, in my view, only refers to a specific portion of the Caribbean Basin - the Venezuelan Plain, and not its entire area. But regardless of what Plato says, I am in complete agreement with your idea that the Gulf of Mexico was also once a dry basin, and at the same time as the Caribbean was dry. I believe both basins were filled in and became seas at the same time. Plato hints at this when he says that the entire kingdom of Atlantis was divided amongst Atlas and his nine brothers and their respective descendants. I think the rectangular plain was the domain of Atlas whereas the Gulf of Mexico basin and the ther parts of the Caribbean (like the western Caribbean) were ruled by the descendants of his brothers who were the lesser kings. I am planning on writing an article on this very subject on the near future. This is also possible. Would be cool to find a screen shot someone might have taken of this before they “Doctored” it. Atlantis is in the middle of the Atlantic West of the Straits of Gibralter right where Plato said it was and you could see the streets until the evil google maps colored in all the oceans so you cant see all the underwater ruins all over the earth. The cataclysms come from Planet X and it is about to rip the earth apart again. Been following your articles here Mr Yoon. I think you are right on the money about this area. If one was to suppose the measurements in Plato’s description of Atlantis may have been misunderstood or miscalculated from the original accounts, and the Gulf of Mexico was also included? This would more than fit the description of Atlantis with Cuba as being the “Center Island”. Sitting on a watercraft at sea level it very well would appear to be a large “ringed" inner sea if The Gulf of Mexico and the Florida Keys were included.